Like the Frontside Bottom Turn the Backside Bottom Turn is the most important move in surfing. The backside bottom turn is essential for every other move in your backside repertoire. It allows you to gain speed, hit the lip, and change your position on the wave. Start by catching a backside wave, and riding down the face with as much speed as possible. Ride straight down the wave, and when you reach the flats start your bottom turn right away. To start your Bottom Turn bend your knees, lean on your heel side edge, and turn your upper body in the direction you want to go. Look over your front shoulder. This will initiate the turn and allow you to see the lip you are about to hit. Your weight should be evenly distributed between your front and back feet. Ride through the beginning of the turn without dragging your heels in the water in-order to maximize your speed. It is very important to keep your original line through the turn so you don‚t loose any speed. Try to pick the right line from the beginning. When you begin to go back up the wave transfer most of your weight to your back foot, and drive up the wave face to gain the maximum amount of speed possible for the wave. Focus on the section of the lip you want to hit, and on pushing with your back leg. Finish your powerful bottom turn with a big bash or a nice cutback, and continue down the line to do another one. When you get the bottom turn down try to hit the lip vertically or even over vertically. Just like the frontside bottom turn the most important thing is your attention to detail. If you don‚t make any little mistakes, and if you‚re using the wave properly you will always be gaining speed for your next move. Start your bottom turn as soon as you reach the flats. Stay with your original line, and ride it cleanly. Turn your upper body towards the lip to see where you‚re going. Put pressure on your back foot to gain speed. The backside re-entry is a fairly basic move, but it requires excellent timing and body positioning to be completed effectively. Start your bottom turn with a good amount of speed toward the steepest part of the wave where the lip is justabout to break. Once you've started the bottom turn, fully commit to it, and drive through it to gain momentum and to get completely vertical. Your eyes should be focused on the lip you are about to hit, and you should have your shoulders rotated so your upper body is facing the lip. Rotating your shoulders will allow you to get as vertical as possible. Your knees should be bent with most of the pressure on your back foot. Proceed straight up the wave until your board hits the breaking lip. Now you need to change directions so your momentum does not carry you off the top of the wave. When about one third of your board is above the lip turn your leading shoulder down back towards the beach. This will cause your lower body and your board to follow your upper body and rotate toward the beach. You should be leaning over your front foot with a low center of gravity while extending your back leg. The back leg extension will push your tail out the back of the wave, adding spray and style to the move, and it may cause your tail to slide so be ready. At this point you will be facing back down toward your landing place, and you may get stuck in the falling lip while your re-entering the wave. Stay low and centered over your front foot until the wave pulls you back in. Once you feel your momentum going down the wave switch your weight from your front foot to your back foot in order to stop yourself from nose diving. Absorb the landing with your knees and continue to ride down the line. To make this maneuver more challenging you can extend your board further above the lip, and you can try to go over vertical on the way up. 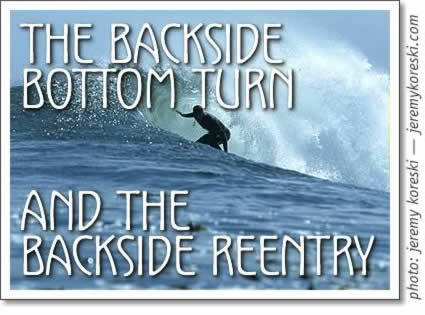 The backside re-entry is a move that is great for steep point breaks because they are easy to do over and over again plus they never get boring. Commit to your bottom turn once it's started. Rotate your lead shoulder toward the beach when the nose of your board is above the lip. Extend your back leg, and stay low. Push on your back leg so you don't nose dive. Tofino surfschool: The Backside bottom turn and the back side reentry are explained by Tofino surfer Pete Devries in this article for Tofino Time Magazine.